I continue liveblogging from the i3 conference at RGU in Aberdeen. The second talk this afternoon that I've attended was authored by John Mowbray, Professor Hazel Hall, Professor Robert Raeside and Dr Peter Robertson (presented by Mowbray, based on his PhD work): Job search information behaviours: an ego-net study of networking and social media use amongst young jobseekers. This research was sponsored by the ESRC, and Mowbray was also exploring issues with Skills Development Scotland. He started with some statistics e.g. 61% people use social media during job search; 31% find jobs through people they know. Previous research has suggested that it is important (for job searching) to have strong social networks, and tap into wider "weak" social ties too. Social capital is also an issue: developing social capital, and using those in your network who have social capital. Mowbray said there was a gap in terms of rigourous studies of job searching network. 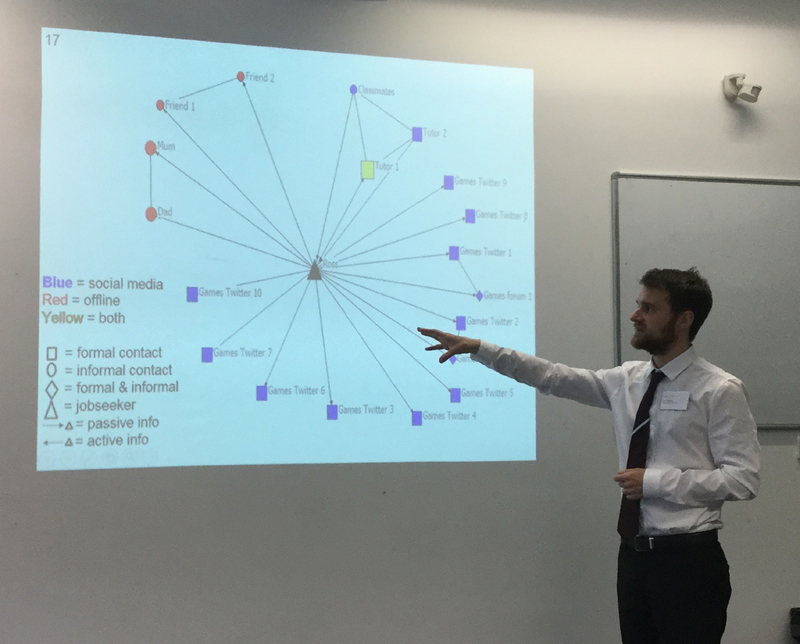 Mowbray's research questions were concerned with: what are the key offline networking behaviours employed by young jobseekers during the job search process, and how do social media tools engage with those behaviours. This presentation focused on the initial, qualitative, stage of the research. 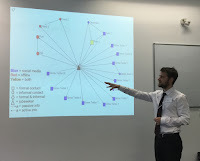 There were 7 interviewees (17-24 years, 2 females, based in various locations in Scotland) Tom Wilson's 1981 information seeking behaviour model was used as a framework for the interviews (so gathering data on the person in context, barriers to job seeking, and on actual information seeking). Ego-net data was gathered by a "name generator approach" (asking them literally to name the people/organisations that had given them help; then asking questions about the help given). This was analysed using content analysis and also quantified to create ego-net visuals. Mowbray then gave more findings relating to specific interviewees. "Ross" wanted an internship in the software industry, he did job search daily. His network included family (Mum and Dad), friends, tutors, classmates and various connections to gaming contacts either via games forums or via Twitter. This included forums hosted by companies that Ross wanted to work with: there was sometimes information about the skills needed in games developers posted in these forums and Ross could be active in the forum. Ross got 4 types of information: on practical skills needed; industry and job roles; contacts and leads and job opportunities. A second interviewee "Steve" was doing less frequent job serach, with a much smaller network, and he was a less active networker (the information was being pushed to him, rather than him seeking it). There was passive information seeking, notably coming across job related information on Facebook. There was also a lot less information being acquired about skills, job roles and job opportunities. The barriers to job search were typically: social (not knowing people to ask etc. ), intrapersonal barriers (e.g. not thinking about using social media); situational barriers (e.g. lack of access to the internet). Conclusions at the moment include: situational context directing networking behaviours, and therefore "social capital accessed is largely ascribed in nature (e.g. family contacts)". It was also notable how "sporadic and unplanned" the information behaviour was (it being opportunistic etc.) Where social media WAS used it could have "potentially profound information impact" and could "provide access to higher level of (informational) social capital". Photos by Sheila Webber: Mowbray presenting "Ross"
How can we all best use scientific evidence?